Rabbit OX40, Fc Tag (OX0-R5254) is expressed from human 293 cells (HEK293). It contains AA Ala 19 - Gln 208 (Accession # O02764). The protein has a calculated MW of 47.3 kDa. 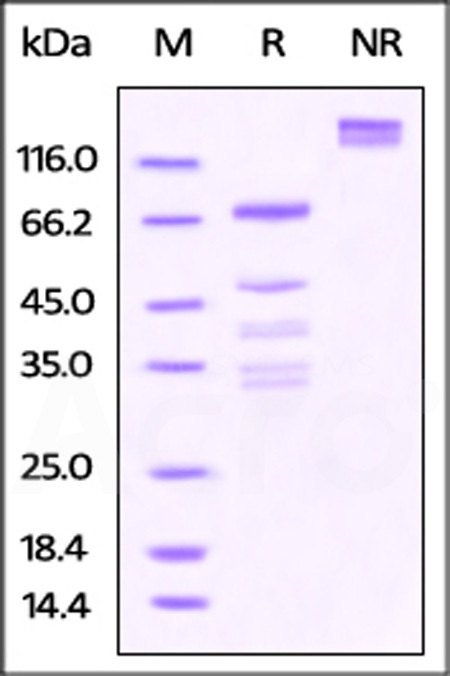 As a result of different glycosylation, the protein migrates as 48 kDa and 68 kDa under reducing (R) condition, and 120-135 kDa under non-reducing (NR) condition (SDS-PAGE). Rabbit OX40, Fc Tag on SDS-PAGE under reducing (R) and non-reducing (NR) conditions. The gel was stained overnight with Coomassie Blue. The purity of the protein is greater than 85%. Tumor necrosis factor receptor superfamily member 4 (TNFRSF4) is also known as ACT35 antigen, OX40L receptor, TAX transcriptionally-activated glycoprotein 1 receptor, CD antigen CD134, OX40. OX40 / TNFRSF4 contains four TNFR-Cys repeats. TNFRSF4 is receptor for TNFSF4 / OX40L / GP34 and can interacts with TRAF2, TRAF3 and TRAF5. (1) Arch R.H., et al., 1998, Mol. Cell. Biol. 18:558-565. (2) Kawamata S., et al., 1998, J. Biol. Chem. 273:5808-5814.